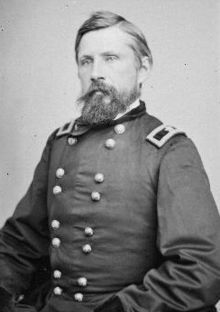 Today in Masonic History George Henry Gordon is born in 1823. George Henry Gordon is an American soldier and attorney. Gordon was born in Charlestown, Massachusetts. He would move to Framingham, Massachusetts at the age of 5 with his widowed mother. He would graduate from the United States Military Academy in 1846. He would graduate 43rd out of a class of 59 cadets. Gordon would serve in the Mexican-American. He would receive a brevet to the rank of first lieutenant for gallantry at Cerro Gordo. In 1854, Gordon would resign from the Army. He would take classes at Harvard Law School and begin practicing law in the Boston area. In 1861, when the Civil War broke out, Gordon organized and become colonel of the 2nd Regiment Massachusetts Volunteer Infantry. He and his unit were assigned to guard the upper Potomac River and Frederick, Maryland. Frederick being a very active area during the Civil War. It was briefly the capital of Maryland when the Maryland legislature took up the discussion of secession. Maryland was a "slave state" and many fleeing slaves came from or through Frederick to join up with Union forces. In 1862, Gordon served briefly under Major General Nathaniel P. Banks who opposed, unsuccessfully, Major General Stonewall Jackson in the Shenandoah Valley. That same year Gordon would be appointed brigadier general of volunteers. After Gordon's promotion, he was given command XII Corps, Army of the Potomac. With the XII Corps Gordon would serve at the Battle of Antietam which was the bloodiest one day battle in United States history. There was a combined loss on that day of 22,717 lives. Following the Battle of Gettysburg, Gordon was given command of the 1st division of the XI Corps. With them he would be stationed on Folly Island, South Carolina. Until he left the service he would become part of the Department of Virginia as well. Gordon would leave the Army on August 24th, 1865. The following January, President Andrew Johnson would nominate Gordon to be promoted to the honorary grade of brevet major general, United States Army Volunteers. The nomination was approved by the United States Senate in March of 1866. After retiring, Gordon would return to his law practice in Boston. He would also become one of the founders of the Military Historical Society of Massachusetts. He would publish several books regarding the Civil War. Gordon would pass away on August 30, 1886. Gordon was a member of Bunker Hill Lodge in Massachusetts.